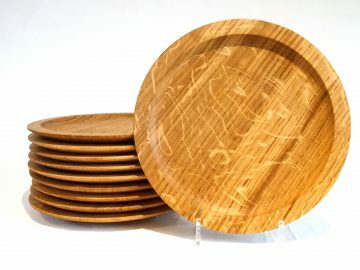 I have been making wooden plates for a long time. There has always been a steady demand from customers, galleries and my family & friends. In Medieval times most people used wooden plates and bowls-it was not just the poor but all social classes. There is a great book by Robin Wood called “The Wooden Bowl” which goes into this in fascinating detail and is well worth having in any woodturners library. It is full of interesting information and social history. One of the difficulties of making plates is that they are made from 25mm thick planks of wood. If this wood is not quarter sawn it is very likely to warp with the constant use and washing. There is very little movement in quarter sawn and it is therefore very stable. With Flatsawn wood the growth rings try to straighten – turning the plank up at each side making it banana shaped. I like using ash, beech, oak and walnut for my plates but most hardwoods would do. I would love to get hold of some quarter sawn London Plain as this like Oak would show some interesting medullary rays. I start by cutting the stock on the bandsaw from a 25mm plank using a template which also has a punch hole so I can mark the centre of the wood. The blank can then be screwed to a face plate with short screws, although I prefer to use a 65mm saw-toothed drill bit in my pillar drill to make a small recess to fit it into my chuck in expanding mode. From here you can turn the outside of the plate. It needs a wide base to stop the plate rocking. The bases of my dining plates are 170mm in diameter and about 3mm deep. I finish by coating the outside with cold pressed linseed oil-give it a minute to soak in and then after wiping off the surplus and slowing the lathe speed – sand from 120 to 240 grit. The abrasive will clog with the oil but the slurry can easily be removed with a wire brush and the abrasive used again. When satisfied lightly oil again and burnish with a kitchen towel. To turn the inside I use ‘home made’ wooden jaws on my chuck to hold the work piece on the 3mm deep foot. Wood jaws are so useful- if anyone wants to know how to make them-email me and I will explain. Try to make the plate rim of a constant size for your set of plates and give them all flat bottoms to the centre. –you do not want the gravy pooling in the middle! Finish as explained earlier for the outside. In use they should be hand washed in warm soapy water and wiped dry. Only re-oil them very, very occasionally. With proper care they will become a family heirloom.